The ambitious aims of US entrepreneur Todd Warnock and renowned course developer Mike Keiser are outlined in documents lodged with a planning application for the proposed 18-hole Coul Links course near Embo. They believe it will be one of the world’s top 50 courses, it will be played up to 15,000 times in the first year and lead to 10,000 more overnight stays by visitors, transforming the local economy and the Scottish golfing market. And they claim to have had the backing of 80% of local residents at recent consultation events. 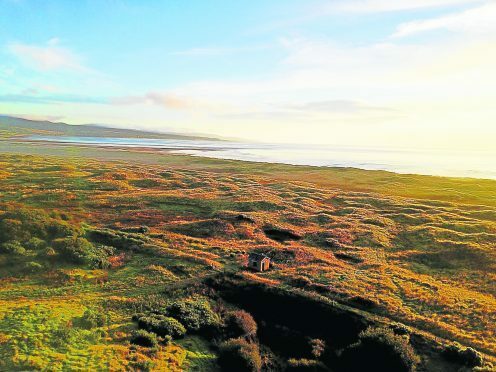 But a group of leading conservation charities yesterday urged the public to back their objections to the £8million project, arguing it would cause the “destruction of one of Scotland’s last remaining coastal dune systems”. They fear that it will impact on the habitats of curlew, whinchat, and Fonseca’s seed fly, which they say are “unique to this part of Sutherland, are rare or in severe decline elsewhere in the UK”. However, the developers say that the conservation of vegetation and wildlife eco-systems, particularly birds and insects, would “actually be improved under our plan”. Outlining their economic objectives, they also say that since the opening of the celebrated Castle Stuart course near Inverness in 2009, there has been a 36% rise in golfing visitors to Sutherland but a 48% decline in people staying overnight, with many golfers now booking into hotels in the Highland capital and taking day trips to play Royal Dornoch. Building a second world-class course near Royal Dornoch would “tip the centre of gravity of the Highland golfing market north” and result in the Dornoch area becoming the “epicentre”, they argue. The scheme would include an 18 hole course, a “golf club facilities building”, as well as restoring existing buildings to create a pro-shop, caddy workshop and administration office. There would also be an 85 space car park, a 8-acre practice area and a 3674ft access road to the site. With no hotel or housing included in the plans, the developers believe there could be an extra 10,000 overnight stays in Sutherland – “revitalising” places such as Brora, Golspie, Tain and Embo – with local clubs entering a joint marketing initiative to encourage visitors to play other courses. And golf students from the University of the Highlands and Islands would be able to undertake courses at the site. By the 10th year, they say the course could add £8.1million and 250 jobs to Sutherland’s economy, £13.1million and 450 jobs to the Highlands, and about £20.1million and 680 jobs across Scotland. The developers state in planning documents that their “conservative” estimates indicate that the course would “help to attract and retain significant numbers of high-value international visitors to Dornoch and help to transform the local area into one of Scotland’s top golfing destinations”. Environmental campaigners have drawn parallels with Donald Trump’s Aberdeenshire golf development as they warned it would be “unthinkable” to lose another “irreplaceable duneland”. The Scottish Wildlife Trust, RSPB Scotland, Buglife Scotland, Plantlife Scotland, Butterfly Conservation Scotland and the Marine Conservation Society are objecting to the proposals for Coul Links near Embo. They say it hosts a dune ecosystem of national and international importance, and is home to rare species such as curlew, whinchat, and Fonseca’s seed fly, which are “unlikely to remain” following “damage” to the dunes. Davie Black, of Plantlife, said: “The proposed destruction of Coul Links, one of Scotland’s last remaining coastal dune systems, would be a disaster and must be wholeheartedly opposed by all those who care about nature and heritage. Jonathan Hughes, chief executive of the Scottish Wildlife Trust, said: “It seems extraordinary that this internationally important dune system is under threat from yet another golf course proposal and it’s vital we protect it for future generations to enjoy. However, an environmental statement (ES) carried out for the developers concluded the scheme would have “no significant adverse effects”, and even boost some species, including Fonseca’s seed fly. “The proposed development has evolved through expert advice and taking into consideration the comments of consultees to avoid direct impact where possible,” it said.